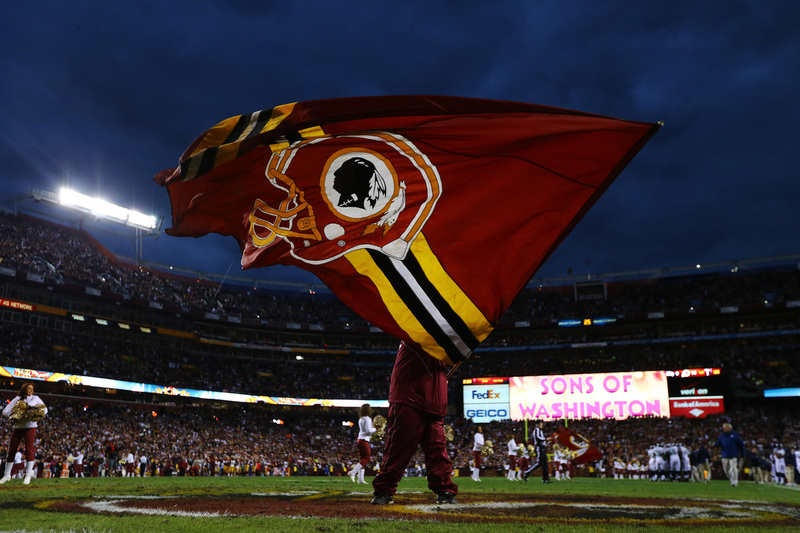 A Washington Redskins flag is waved prior to the NFC Wild Card Playoff Game against the Seattle Seahawks at FedExField in January. Native American groups have pushed the Washington Redskins to change its name for more than 20 years, arguing that the moniker is offensive and culturally insensitive. Today, that push got a little wind when the Smithsonian's National Museum of the American Indian held a day-long academic symposium on "racist" stereotypes in American sports. In a column timed to coincide with the start of the symposium, Washington Post columnist Robert McCartney wrote that "it's time to take a stand" and change the team mascot. "It's the worst racial slur used as a team name in American sports," McCartney wrote. "Dictionaries have labeled the word as 'often offensive' at least since the 1970s." Suzan Shown Harjo, president of the Morning Star Institute, an advocacy group, said at the symposium that two-thirds of team names with Native references have been changed since 1970, with less than 1,000 remaining. Harjo filed the first lawsuit against the Redskins in 1992, but the U.S. Supreme Court refused to hear the case. Another case, filed before the federal Trademark Trial and Appeal Board in 2006, will be heard in March. Team owner Dan Snyder has made clear his opposition to any name change. The team's attorneys said in the past that the name "Redskins" was given in 1933 to honor Native Americans. An attorney for the team was quoted in a Washington Post article last year saying that the team is "one of most well-known pro football teams in the U.S. and a well-respected franchise, that's what the Washington Redskins means to the public." The AP reports that just last week, students at Cooperstown high school in New York voted to change their nickname. Instead of the "Redskins," they will be known as the "Deerslayers," "Hawkeyes" or "Pathfinders."